Joe Turnbull reports from The Voice and the Lens festival (Whitechapel Gallery and Rich Mix) where he finds himself immersed in a Divine Comedy of tattoos, back slang and post-industrial rave/pop. The advent of sound recording and motion pictures are two of the most beguiling developments in the last 150 years. Undoubtedly these technologies – which both came to fruition separately in the late 19th century – changed the face of the cultural and artistic landscape irrevocably. It took almost another half century for the two to be formally combined and the western cultural tradition hasn't looked back since. The Voice and the Lens curated by Sam Belinfante and Ed McKeon was a weekend-long festival exploring the relationship between the human voice and moving image, encompassing film screenings, live performances and talks delivered by vocalists and multimedia artists. Recording technologies allow moments to be captured, manipulated and duplicated in a way that simply wasn't possible before. 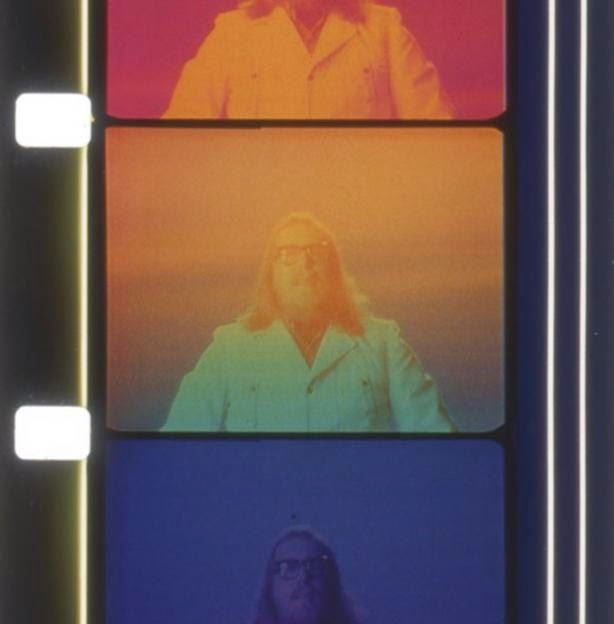 This tension between the original moment and the recording is clearly a theme that the curators wished to explore through their programming, with several of the works addressing the original/copy relationship, often combining live performance with pre-recorded material to blur the lines. Starting anachronistically at the end – the final piece shown on the concluding day of the festival – 102 Years out of Sync, 2013 performed by Mikhail Karikis and Adam de la Cour was a unique take on this subject of original/copy through a historical lens. 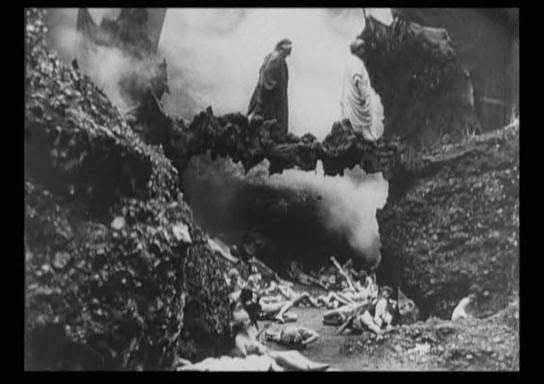 The performance told the story of L'Inferno; the first feature film produced in Italy from 1911, which was a silent epic, reimagining Dante's famous poem. The visuals were considered groundbreaking at the time, depicting the hellish landscape of Lardarello, an area of Tuscany said to have been the inspiration for Dante's original work. The region is beset by a confluence of geothermal forces, producing geysers which spew deadly steam into the atmosphere. The site later became the first place in the world to have a geothermal power station. 102 Years out of Sync combines original (or should that be copied?) footage from L'Inferno with equally breathtaking images of modern Lardarello, with its industrial pipes and structures seeming to organically emerge from the great rocky chasms of the landscape. Even more striking than the visuals are the environmental sound recordings that accompany them. They have a low, drone-like quality; they sound primeval, mournful and guttural, as if the pipes are siphoning the voice of the very earth itself. Karikis is of course also giving a voice to the previously mute footage of L'Inferno, an arguably problematic endeavour despite the efficacy of the results. 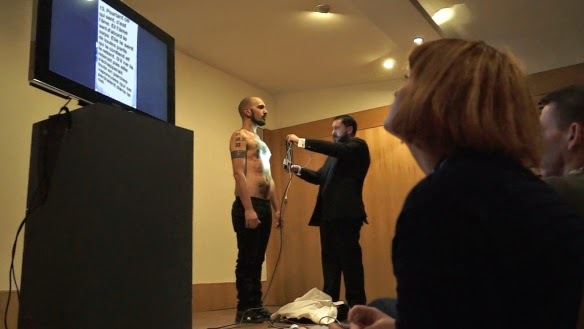 Another work combining performative and recorded elements was art collective AMAE and Pier Giorgio De Pinto's 58(+1) Indices on the Body, A Living Archive, 2014 which engages with the work of French philosopher Jean-Luc Nancy's ruminations on the modern corpus. The performance consisted of a man, stripped to the waist, covered in tattoos depicting different numbers (one presumes, 1-58). A second man used a tablet computer to scan the different indices, causing a related text by Nancy to appear on a screen alongside the live feed of the tablet's camera. The performer's body was thus literally and metaphorically inscribed with meanings through the tattoos, though some of those meanings were artificially projected. Scars, tattoos and other marks on our bodies mean they are effectively living archives, but this piece took that notion a step further by transposing literal discourses onto the physical body. The performance itself was unsettling. 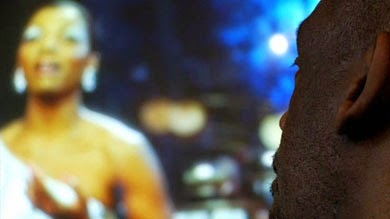 The performer's body was treated like an object or test subject whilst he remained completely silent, even complaisant. It raised all sorts of questions about the role of technology on the modern body, with cybernetics and wearable technology finally starting to take off in earnest. It also highlighted the power relations at play in mediating meanings of the human body through language. Multimedia artist, Imogen Stidworthy's conversation with curator Sam Belinfante offered an illuminating insight into a number of her video works which focus on the presence of the human voice. The talk was interspersed with samples of a number of her different projects. Particularly interesting was her piece Barrabackslarrabang, 2010 exploring the almost forgotten language of 'back slang' which was developed by dock workers in Liverpool in the first half of the 20th century. The coded speech empowered working class, often non-white speakers by giving them control over that ultimate arbiter of meaning and power, language. It also helped to disguise any illicit activities from the authorities. Although 'back slang' is now little more than a relic of a particular social/cultural moment, a handful of members of certain subcultures still speak it with pride. It's a reminder that language is unstable, fluid and constantly adapting in relation to social conditions but also fiercely contested, reflecting wider power struggles in society. There was a number of performances which provided a comic counterpoint to all the philosophical cogitation. Dante Rendle Traynor's laughably facile performance consisted of him singing the refrain 'Cambridge: boring, London: busy, Thailand: interesting' slightly off key to some cheesy Casio-keyboard style backing track, accompanied by home-movie footage of the three locations. It seemed a searing satire of the middle-class obsession with gap years and the idea that you can 'travel yourself interesting'. Equally comical was Lina Lapelye's live performance of what can only be described as post-industrial rave/pop music with catchy one-liners like 'i am a snake' and 'I'm gonna edit you' repeated to the point of absurdity. That's just the (heavily) edited highlights from the final day of the festival at Whitechapel Art Gallery, with other events including a sound installation as part of Spitalfields Music's Summer Festival at LimeWharf and an evening of video pieces shown on two different screens at Rich Mix's cinema. If the final event was anything to go by, the programming of the The Voice and the Lens was truly ambitious and richly varied, but ultimately coherent. For me, the curators achieved their stated aim of upsetting the traditional hierarchies which often place the original (or the finished 'work') above the performance/process involved. The Voice and the Lens was a festival exploring the human voice as experienced through film and performance curated by Sam Belinfante and Ed McKeon. It was held on 13 – 15 June 2014 at Whitechapel Gallery and Spitalfields Music Summer Festival at Rich Mix.